Japan's Prime Minister Yukio Hatoyama came under fire for this outfit he wore at a Japanese BBQ he recently organized. Tokyo, Japan (CNN) -- When pictures of Prime Minister Yukio Hatoyama's multi-colored button down shirt started spreading on the Internet, people around the world cringed. But not Peter Crawfurd and Michael Yang. They saw brilliance. "Extraordinary," said Yang, of Hatoyama's purple, red, yellow, blue and green shirt. "That's exactly what we see in the Japanese prime minister. Mr. Hatoyama is a great symbol for that. We believe in individuality and people should be able to dress as they want." And for $500, you can own your own Hatoyama shirt. Crawfurd and Yang, two 26-year-old buddies who met in high school in Denmark, run a build-your-own-shirt business based in China. By build, they mean pick your own fabrics, cuts and colors on their Web site, www.ShirtsMyWay.com. The company claims users can design over 7 trillion different men's dress shirts, by breaking the shirt into components and custom- tailored fits. You pick, they make, and ship it to your door. They said they like very individual fashion choices. Which is why even though they're not the original designers of Hatoyama's shirt, they're launching a replica, a special "Prime Minister Hatoyama shirt," so you, too, can have Hatoyama's every color of the rainbow shirt. They are convinced someone out there really does want it. Video: Japan PM's political fashion disaster? "Regardless of what people out there think is fashionable or not, it's one of the bravest moves we've ever seen," said Yang. "We honor his bravery because it takes a brave man to face the world with so many colors, especially a man in his position. We stand behind him 100 percent." "There's a lot of integrity in what he's doing," added Crawfurd. "Just because he's prime minister, doesn't mean he loses this part of him." The entrepreneurs are by no means just looking to honor Japan's leader. 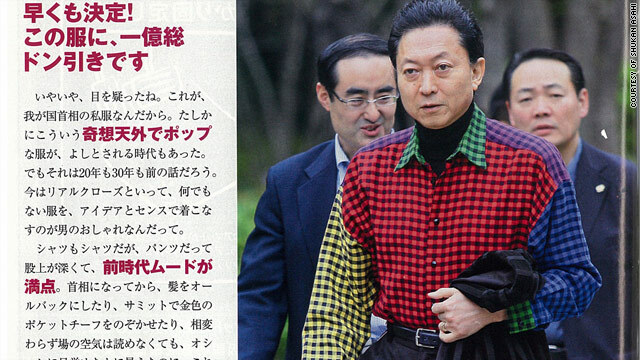 They see a business opportunity by coat tailing off the Internet buzz on Hatoyama's bold shirt. But they also think critics are "too harsh," said Yang. "I don't know what else to say. Yes, too harsh." The Prime Minister under fire this week, from both outside the political halls of Tokyo and within, after he backed out of a campaign promise to move a disputed U.S. air base off the island of Okinawa. But as tensions in the Korean peninsula and pressure from Washington mounted, the prime minister caved on that campaign promise on Sunday. This week, the political fallout has begun. Members of the opposition party, the Liberal Democratic Party, are now calling on him to resign. In Okinawa, it is full-on name calling, with residents saying he is a liar. National polls show his approval ratings are below 30 percent. But outside of Japan, at least two entrepreneurs are cheering him on. They just launched their Hatoyama shirt special Wednesday morning in Asia and say they have already gotten an order. They hope customers will at least want to look like the prime minister, regardless of the political turmoil Hatoyama currently faces. Japan's housewives helping to drive deflation?